Repairing and renovating homes very often involves cutting concrete with precision. Removing or resizing kitchen slabs, making holes in ceilings and reshaping driveways are a few instances when it becomes imperative to cut concrete. Concrete Saw: A good option is the Bosch 12″ Electric Concrete Saw that has AC/DC capacity and features a reversible handle for added convenience and versatility. It also has a large footplate that improves stability and cuts at a greater depth. Layout: Use chalk to mark the area to be cut. A concrete saw cuts in straight lines. Prepare the saw: Fit the concrete saw with a diamond or abrasive blade. Set the blade at the required depth, which may be 50.8 mm (2 inches) to 152.4 mm (6 inches). Most house slabs, driveways and retainer walls fall within this range. Cut: Start cutting from the edge of the concrete, slowly following the line drawn in chalk. Pour water: Keep the blade cool by pouring water over it as the cut progresses. This also helps to reduce dust. Progress slowly: Proceed slowly, with minimum RPM as this helps to keep the saw in line, prevents overheating and prevents the tossing up of shrapnel into the air when the cutting is in progress. Remove the concrete: If the concrete is thicker than what the saw would cut, a jackhammer may have to be deployed to pound the excess concrete away. 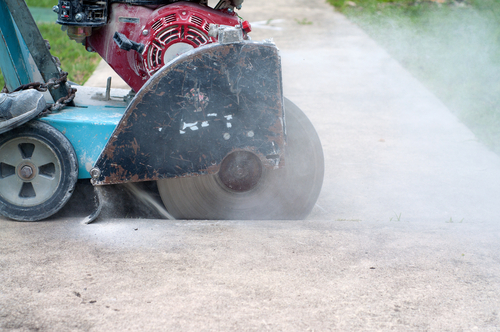 An alternative is to use heavy-duty concrete saws that cut up to 18 inches deep. 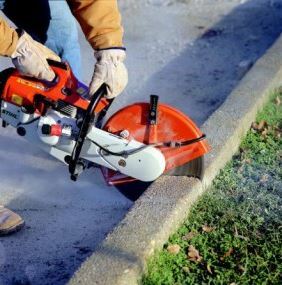 Chip off the edges: If clean corners are required, score off the corners using a 4-inch diameter electric cut off tool and chip away the rest of the concrete using a small pneumatic chisel. Make sure to take appropriate safety precautions. The process generates high levels of noise and dust. Ear plugs and goggles are a must, as are other safety precautions when cutting large chunks of concrete. Keep in mind that the majority of concrete cutting problems (and injuries) can be solved by using the appropriate tools for the job. Still have questions? Talk to an expert to provide advice on your project.